Matson's second Monterey was built for the U.S. Maritime Commission by Bethlehem-Sparrows Point Shipyard, Inc., Sparrows Point, Maryland. Launched in May 1952 as the cargo carrier Free State Mariner, she was completed and delivered by the end of that year. In 1955, the ship was sold to Matson and rebuilt as a passenger ship by Willamette Iron & Steel of Portland, Oregon. Renamed Monterey, she entered Matson service on 8 January 1958, with a trip from San Francisco to Sydney, with stops at Honolulu and Auckland. In 1971, Monterey was sold to Pacific Far East Line, Inc., which used her for Pacific Ocean cruises. 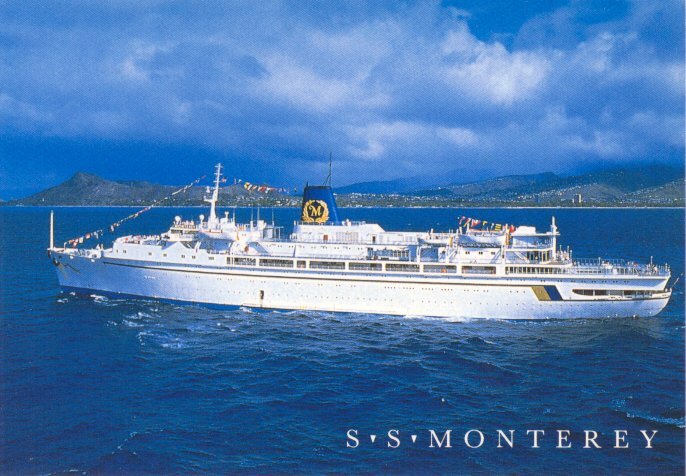 Laid up in 1978, Monterey passed through numerous owners over the next ten years before returning to service for Aloha Pacific Cruises in 1988. She then changed hands several more times in 1989 and 1990, before ending up with Mediterranean Shipping Co., for whom she is still in service, 49 years after her launch. Sources: Kludas' Great Passenger Ships of the World Today; Mediterranean Shipping Company Web Site (http://www.mscgeneva.com/).